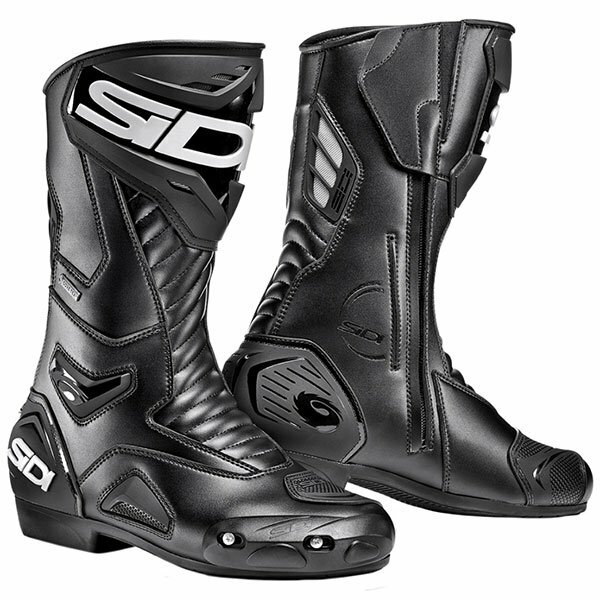 fantastic replacements for the Dainese Nexus boots which sprung a leak, comfortable and warm,. I ordered a size larger due to wide feet and they fit perfect too! These replaced an old (8+yr) Dianesse D-Dry boots. I wanted something of the same shin height or ideally taller. These are the same height, only worn them once so far and ok apart from being slightly too big, if they stretch then I'll be looking for another pair. I'm normally a 43 but after reading reviews went for 44 which I thought were a tad big. So ordered a 43 but couldn't get them on so 44 it is/was. I only wanted to spend about £100-£130 so although these were in the sale at £180 and being Gore-Tex which I wasn't expecting to buy ok. So for the quality and features happy although yet to experience a WET ride if they leak then back they will go. I'm sure I'm not the only rider out there who wants a touring boot which has some height but unless you want an off-road bias boot then your buggered. These are about 14"/35-36cm I only want another 1-1.5" or boots at about 40cm. Had sidi boots before that lasted nearly 10 years! These seem pretty well made, and fitting is similar to normal shoes. I went one half EU size up and they were perfect. Would recommend. Can't fault these superb, quality boots! Bought these to replace my old ruined SIDI Gore-Tex boots. They lasted me since 2007, the soles were so worn there were holes in them, but still waterproof, warm and comfortable! Only just now the left one is leaking after the heel was hanging off. Says everything about the quality from SIDI. I bought other boots two years ago but they turned out to be nowhere near waterproof or as comfortable, so I kept going back to my old boots. This time I decided to just buy the brand I knew and loved and stopped wasting money on cheaper, poorer quality boots. 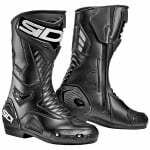 Unfortunately the boots I had are no longer made by SIDI but these seem to be the natural replacement. I've done about 200 miles in them now and the quality is evident from the start. Real leather is evident throughout and gives a good feel. Fit is as you wear normally, I'm a size 9 in shoe and the size 9 (43) boot fits perfectly. I'm flat footed, these boots have a small instep for support but by no means uncomfortable. Their warm without being sweaty and most definitely waterproof! I've only ridden in the rain with them so far, including torrential down pour this morning, with not a hint of water seeping through. Looking forward to seeing how the ventilation works during the summer months. Their also stylish without being outlandish, usable in all weathers and come with replaceable toe sliders for track use! If you're looking for waterproof all year round quality boots, these are not just a should buy but a must buy!! Great service from SBS too, thanks!